Is Confucianism a religion? If so, why do most Chinese think it isnt? From ancient Confucian temples, to nineteenth-century archives, to the testimony of people interviewed by the author throughout China over a period of more than a decade, this book traces the birth and growth of the idea of Confucianism as a world religion. The book begins at Oxford, in the late nineteenth century, when Friedrich Max Müller and James Legge classified Confucianism as a world religion in the new discourse of "world religions" and the emerging discipline of comparative religion. Anna Sun shows how that decisive moment continues to influence the understanding of Confucianism in the contemporary world, not only in the West but also in China, where the politics of Confucianism has become important to the present regime in a time of transition. 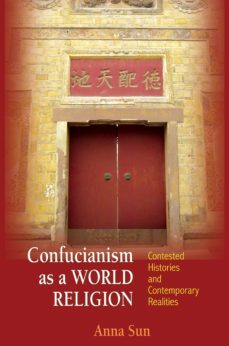 Contested histories of Confucianism are vital signs of social and political change. Sun also examines the revival of Confucianism in contemporary China and the social significance of the ritual practice of Confucian temples. While the Chinese government turns to Confucianism to justify its political agenda, Confucian activists have started a movement to turn Confucianism into a religion. Confucianism as a world religion might have begun as a scholarly construction, but are we witnessing its transformation into a social and political reality? With historical analysis, extensive research, and thoughtful reflection, Confucianism as a World Religion will engage all those interested in religion and global politics at the beginning of the Chinese century.